Like many East Villagers, I ride my Citibike down the Second Avenue bike lane. 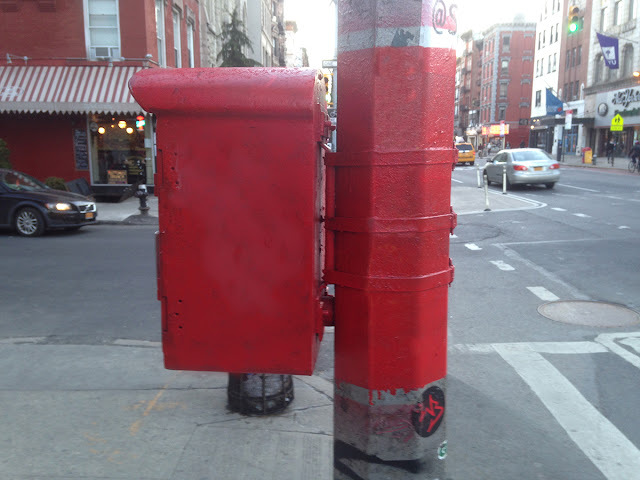 Through a combination of my average speed and the timing of the stoplights, I oftentimes find myself stopped at the corner of East 7th Street, which is where I saw a newly-painted call box (below). The painters must have had a bit of paint left over, because they painted the post beside it also! Unfortunately, this occurred a month or so ago, when it was still dark at 5:30, so I couldn't get a decent picture of it. i don't know if you noticed, but the backgrounds in those two photos are exactly the same? yet the photos were taken a month apart! how incredible is that??? i am TRULY impressed! It was not easy to Photoshop in that background!